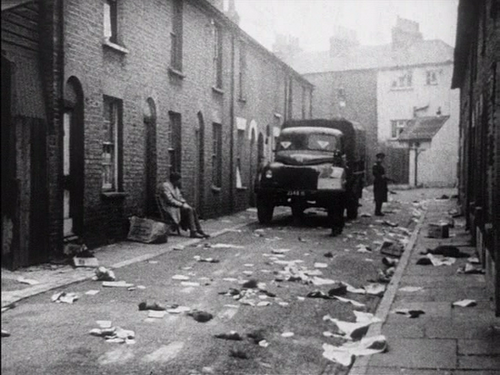 The War Game is a 1965 documentary-style TV film by criminally underappreciated director Peter Watkins. The film, funded by the BBC, aimed to depict the chilling effects of a nuclear strike on England, staging a scenario in the southeastern county of Kent. I’ve borrowed my opening quote from its narrator, Peter Graham, in which he describes in excruciating detail the immediate symptoms of a thermonuclear blast. The whole film, borrowing examples from real historical catastrophes at Hiroshima and Nagasaki and Dresden, juxtaposes the extremity of the human cost of nuclear war with the self-important bloviation of political, military and even religious representatives of the time. This gives The War Game a particularly acerbic, satirical edge, exposing beneath the politicking, strategizing and propagandizing of Cold War-era leaders a frigid-seeming detachment from the lives they were playing with. It’s more of a dry, guttural laugh than a lighthearted giggle. 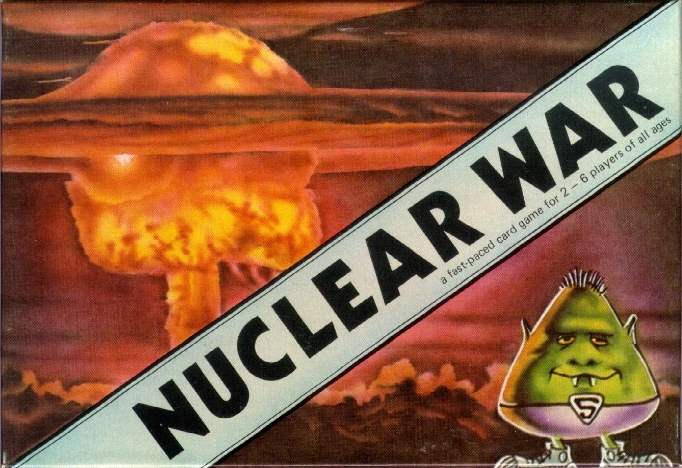 Nuclear War is an American card game, also from 1965. It was originally made by Douglas Malewicki, an aerospace engineer and inventor and was later sold to Rick Loomis, owner of Flying Buffalo. The game has seen a handful of expansions, including Nuclear Proliferation and Weapons of Mass Destruction. But the original is as simple as a deck of “Population” cards and a deck of “Nuclear War” cards, a board with a spinner on it, a set of dice and a paper placemat marked to hold the player’s cards. The game also comes with a “germ” symbol to denote whose turn it is in the game, which hosts between 2 to 6 players. I was introduced to the original version of the game. It’s simple, unadorned and witty. Actually, it’s really darkly funny. I played it with a small crew of friends at an informal board game night. We’d already played more elaborate games like King of Tokyo and Incan Gold, each furnished with generally more modern and shinier bits and pieces. But for all their elegance, they didn’t really stick with me quite like Nuclear War, a game described to me by one of the hosts with muted praise. Where The War Game uses theatricality and brutal imagery to draw attention toward the greed and recklessness of world powers, Nuclear War actually succeeds in doing the opposite. It makes you embody one of those powers, and then it alienates you by turning its premise into a gamble. The “Population” cards are pieced out in equal number according to how many players are present, but each card only represents a certain number of citizens, and each “major power” can end up with a different, sometimes even unfair, population toll. This means that no one starts at an equal footing, and that may influence strategy for the remainder of the game. What immediately stands out about this deck is the fact that your population number is effectively your “score”, since the goal of the game is to be the last power standing with the highest population. All is reduced to a number on a little white card, a number that’s supposed to represent farmers and doctors and activists and schoolchildren and radicalized grandmothers. There are lots of other cute little touches that make Nuclear War both apt and incredibly morbid. At the beginning of each turn, each player must reveal any “secret” or “top secret” cards in their hand of nuke cards, and this can go one way or the other. Sometimes it spells disease, other times population defections of “Beatnik protesters” to or from my country. This, too, can create a somewhat random set of conditions that help inform whether I’ll want to maintain a state of peace, placing down propaganda cards or pre-emptive anti-missile or delivery system cards on my placemat, or set up a missile and prepare for state of war. This revealing of secrets while obscuring of strategies creates a tense state of politicking and feigned diplomacy, and the placemat in itself creates an interesting dynamic. The first card on the mat is visible to players, and the next two are face-down, to be revealed in successive turns. That means I lock myself into a strategy two turns ahead, with limited maneuvering against fate once I’ve made my choice. I can, however, reveal “deterrent cards” in the hopes I might stave off attack, but nothing is ever really guaranteed. What’s probably the most upsetting about Nuclear War is just how fun it is. The mindgames, the tactics and strategies made according to circumstance, the attempts to bluff and swagger between players, and the ever-looming presence of luck keep the game fast-paced and exciting. The effect of The War Game is visceral, by contrast. In it you’re made painfully aware of the spread of disease, the stagnancy of water, the erosion of the social contract, the consolidation of police power, the hunger riots, the tendrils of despair in the hearts of the blasts’ survivors, the delayed death creeping in the soil. And then moral abstractions about the “war of the just” uttered by an unnamed Anglican Bishop are mimicked by a television actor. It’s hard not to watch that and become angry at those powers for rigging this game. It’s hard not to play Nuclear War and, if you give it a moment’s thought, be angry at yourself for being seduced by a rigged game. For all the Spec Ops: The Lines in the world, I don’t think I’ve played a game that captures the spirit of mutually assured destruction, the folly of it, quite like this simple card game. Nuclear War never has to tell me about the mindset created by power in the context of total annihilation, because it allows me to embody it. The thing about nuclear bombs is they’re really dirty. Of course, Nuclear War makes light—maybe a little too light—of such things as fallout, irradiation, mass death and disease. It’s all just random chances on a spinner board. When a missile is launched and a war is effectively declared, the red spinner board lets the attacker spin to see whether their bomber or warhead backfires, hits or is a dud. Alternatively, the board contains a chart detailing the consequences of each roll should the player decide to go with dice instead of the spinner. Either way, declaring war is not an inherent boon, and may even spell disaster for the attacker, with loss of life easily counting in the millions. But one of the game’s best little touches is that, here, in state of war, there is a nonzero chance that everybody dies. When war is declared, it can’t be undeclared until the first player to launch a missile is knocked out of the game. That means genocide must effectively be committed before peace can resume—there is no going back. However, a losing player can go out by detonating all their playable nukes at once, and therefore has a chance to take out another player with them. There’s nothing in the game prohibiting every player from being taken out, losing their entire population. This means that, in all likelihood, you either end up with a pyrrhic victory or, quite literally, no one wins. I’m of two minds about this. It’s so easy to play this game and just take everything for granted. I’m so used to absurd reductions of horrible things in games, but I live in 2014. I look at Nuclear War, the vulgar and inhuman state of mind it asks you to embody, and then I look at The War Game from exactly the same year, representing another Western power, illustrating an irradiated rural England as a real possibility. It provides numbers of predicted casualties, the known targets on English bases, the decimated population at the end of it all. The War Game tells me that the anxieties felt by average people—people who were not politicians and generals but engineers and filmmakers—was real. It hits home that the Cuban Missile Crisis, for instance, was a genuine moment of panic and desperation. And so the dry, caustic, cynical design and structure of Nuclear War hits me as something likely intended to convey bitter sarcasm. It’s as if to say, “This is what they think of us, just numbers on a card, just outcomes on a board.” When The War Game makes use of the words of an unnamed American nuclear strategist, who assumed that “both sides could stop” in preparation for “World Wars four to eight”, I think, yes, of course it must have felt like everyone’s life was no more than a piece in a game between cruel and flippant children. The stockpile is still growing, as a matter of fact. To be more precise, the Obama administration has dedicated at least a trillion dollars over the next three decades to the refurbishment and modernization of nuclear facilities and aging weapons, as well as to the longterm proliferation of bombers and warheads. The US president had run on a platform of disarmament, and had in 2009 signed a deal with Russian president Dmitri Medvedev to cut strategic nuclear arms. But this is also a president dealing with the current ISIL scare, a legacy of the war in Iraq, a president who has in fact authorized massively bloody “precision” drone strikes in the name of anti-terrorism interventions, while Western countries use anti-terror rhetoric to expand executive power and state surveillance. In 2012 the US government was even toying with the idea of nuclear-powered drone bombers, which, due to a remarkably unsafe lack of precision, posed their own unique risks. On the other hand, Putin-led Russia has succeeded in leveraging internal strife in Ukraine—mass protests over the delay of a trade pact with the European Union—into the violent annexation of Crimea. Putin has also accused the West of staging the crisis in Ukraine in order to resuscitate NATO, and has been more than a little intransigent on meeting promises to reduce arms. Now, in fact, he is muscling to proliferate, rather than reduce. But I’m being reductive, here. I’m relegating a huge geopolitical conundrum to the micro-decisions of two personalities, two major players, as if circumstance and history and longstanding biases don’t suggest a coherent explanation for current global unrest. The thing about The War Game is that not a lot of people saw it. The BBC nixed airing the film, deeming it too horrific for public viewing. The thing about Nuclear War is, in being a game, a plaything of frivolous quantifications, it doesn’t elicit the same kind of anxiety in our consciousness. In fact, the game seems to garner mostly middling reactions, and I think at least some of that has to do with how much of it is based on luck, and how little satisfaction there can be in winning. Nuclear War is a reminder that the dynamics of the Cold War, the threat of total annihilation, create and are affected by a network of political decisions and social entanglements, each one much more complex than any state power or personality. The War Game is a summation of what happens when those decisions and entanglements overwhelm reason and decency. It’s not clear that things are more stable now than they were in 1965. Actually, I would go out on a limb and say that in 2014, nothing is. It’s clear that post-boomer Western society is exhausted, anxious, unsure, economically disempowered and politically alienated. Everything, right now, feels like a gamble, despairing and hopeless, and we’re numbers on a white card. Lana Polansky is a Montreal-based writer, game critic, Twine enthusiast and professional scowler. She has written for Kill Screen, Billboard, The Wall Street Journal, Five Out of Ten, Gameranx, Medium Difficulty and Bit Creature.